Johnny Stocks: Have You Made Your Wish List Yet? I was going to go to bed early tonight, but a quick check of the markets showed Japan's Nikkei index down 1200 points, S&P futures down hard, crude back under 100 dollars and gold down over 10 bucks. And as I sat there staring at my trading screens things just went from bad to worse to "worser". Anyone reading my recent posts, or my twitter feeds, know I have been negative on the market for the last couple weeks. The S&P has been turning lower, forming what looks like a "rounding top" over the last 2 weeks. The 20 day moving average (20dma) has turned lower. Price has closed under its 50dma in 2 out of the last 3 days. And the RSI and MACD have both been signaling lower prices. I did not get aggressively short, but over the past couple weeks I've been slowly reducing longs, raising cash, and initiating new short positions. My trading account is small net short currently. So assuming you have some cash on hand, what's the strategy here? The type of price action we are experiencing tends to do a lot of damage to markets. There's no reason to rush in and buy the first dip you see, no matter how cheap a stock looks. This is not your typical run-of-the-mill correction. The Nikkei has suffered its worst 2-day loss since the 1970's and is now trading at its lowest levels since early 2009. S&P futures have reacted by selling off by over 2% tonight (although the futures have bounced off their lows somewhat). What I would recommend is that everyone make a list of high quality stocks they wish to own, write them down, and then make note of key support levels that might provide attractive entry levels. Then look to either scale into the position, or just just place your bids at several support levels below the current price and sit back and wait. Patience will be key here. 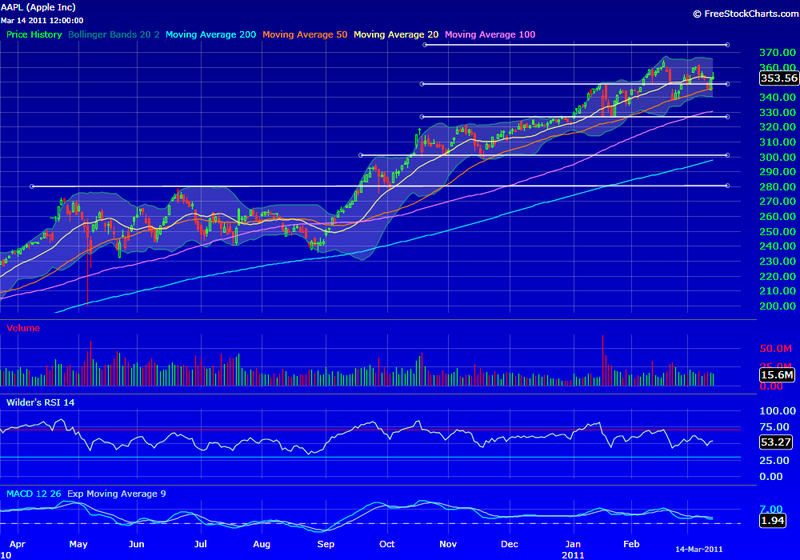 AAPL is a company every likes, but many investors missed the last 80 dollar move over the past 6 months. AAPL closed @ 353.56 on Monday after bouncing off the 50dma support on Friday. Technically you would expect that the 50dma @ 346 would provide some support again. And it might, but in a market like this you need to be patient and wait for better risk/reward entry levels. 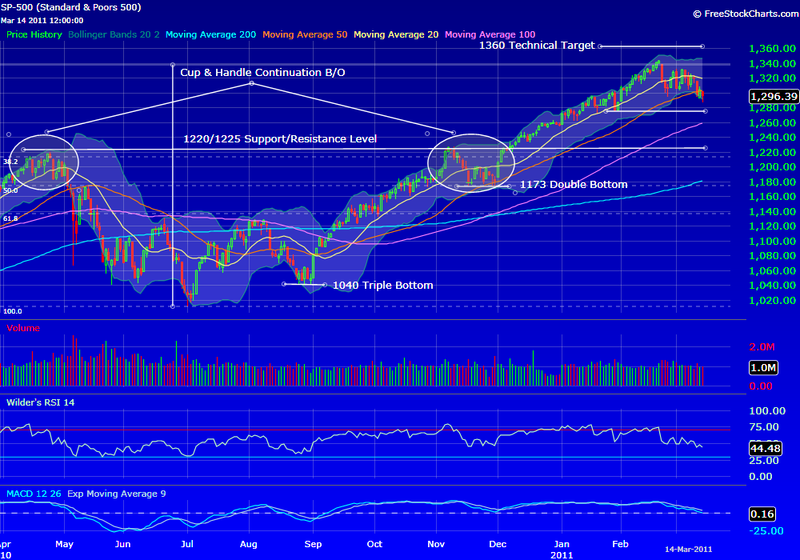 In the case of AAPL one strategy would be to layer into bids between 300-330. 280 is also a massive support level that one might consider. Alternatively you could just place a bid around 300 and hope that the market panics enough to get you filled. There's no need to be a hero here. Just because you have the cash doesn't mean you have to buy anything at any price. Let the sellers come to you. But you need to be prepared as the best opportunities usually don't last long. You need to do your homework BEFORE the market opens and have your bids ready. Earlier tonight I performed a number of scans and came up with a list of 15-20 stocks I would like to own at better levels. The list include companies like AAPL, IBM and ICE among others. Hopefully by the end of the week I will have been successful in buying a few of them at very attractive levels.